An interesting and recurring debate in our democratic experience of the last 20 years has been: how can we wage the anti-corruption war without the suspicion of selective justice and political vendetta? Justice Walter Onnoghen, the embattled chief justice of Nigeria, has just fallen on his sword after three months of intense controversy over alleged infractions. Ordinarily, we should not be arguing at all over the allegations against him. Failing to declare his assets as and when due is already a breach of the law and it is enough to unseat him. There is no mitigation for “I forgot”. The punishment is written in black and white. It should normally be cut and dried. There was a time the Code of Conduct law allowed “I made a mistake” but it has since been amended. However, those sympathetic to Onnoghen argue that his ouster had nothing to do with his bank accounts and estacode, and that he is only a casualty of politics, triggered by the warfare between Governor Nyesom Wike and Amaechi in Rivers state. Onnoghen was believed to have taken sides. They say if Onnoghen’s case was simply about bank accounts, how many Nigerian judges will remain on the bench? Public officers receive payments into their personal accounts from sources that, if made public, could result in a scandal. Those who question the anti-graft war often ask why the bank accounts of other judges were not similarly scrutinised. They even allege that the EFCC masked the names of some lawyers who paid “wedding support” into Onnoghen’s accounts. People have been asking questions about how APC financed its own electioneering and why most of those arrested by the EFCC were PDP supporters. I certainly do not have the answers. I can only say that these are some of the contradictions that the anti-graft war has had to contend with over the years, especially under President Muhammadu Buhari. My default position has always been that as long as the accusations against you are not fabricated, then you have to defend yourself, no matter your political affiliation or persuasion. But even that position is problematic because if two people commit a similar offence and only one is punished because of their political leaning, the essence of crime and punishment is defeated. People will easily figure out how to escape justice. 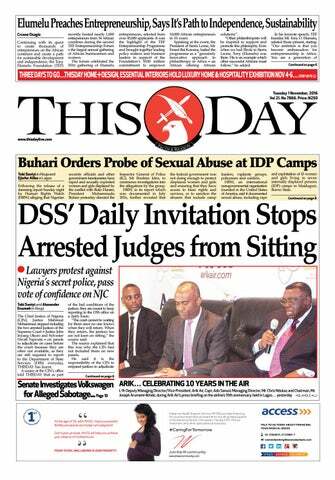 In another case, Mr. Paul Usoro, a senior advocate of Nigeria, has been in the eye of the storm for a while. 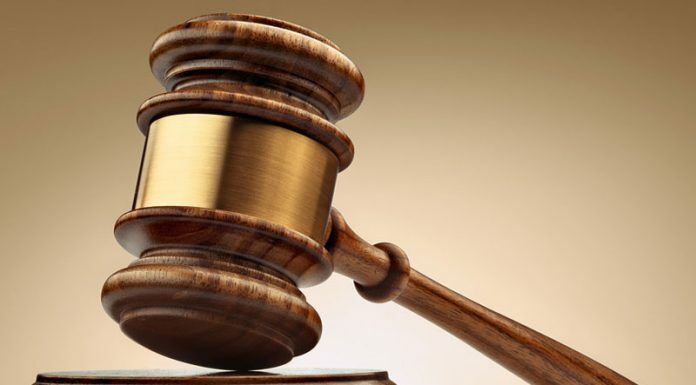 In the run-up to his election as the president of the Nigerian Bar Association (NBA) in August 2018, quite a number of negative media reports began to swarm around him. He soon found himself in the net of the EFCC over allegations of money laundering. I have not been following the matter closely, but the headline that trended for a while was the N1.1 billion payment to his law firm’s account by the Akwa Ibom state government. In another story, N300 million was said to have been paid into the firm’s account by Chief Udom Emmanuel, the governor of Akwa Ibom state. In all, the EFCC is accusing him of laundering N1.4bn. Usoro has denied the allegations of money laundering and will soon have his day in court. From snippets of his explanations I have read here and there, Usoro has continued to insist that the N1.1bn is “legitimate earning” by his law firm for legal services rendered to the Akwa Ibom state government dating back to the days of Chief Godswill Akpabio, who was governor from 2007-2015. He said the payments were made in tranches over a period of two years and not at once as being portrayed in the media. He also said the N300m payment from Emmanuel was not from state coffers and it was to settle the fees of the lawyers in the team that represented the governor in post-election litigation all the way from the petitions tribunal to the Supreme Court. Why then would the EFCC just wake up one morning and pick on Usoro? Is there smoke without fire? That is the question people like me would love to ask. There may be fire and there may be smoke, but Usoro alleges that the fire is purely political and the smoke cannot be money laundering. He said he is a victim of political vendetta. Having represented Senator Bukola Saraki in the false asset declaration case at the Code of Conduct Tribunal (CCT), Usoro will naturally believe that the EFCC has come for him in vengeance, especially as Saraki won the case. It also does not help matters that the senate, under Saraki, repeatedly refused to confirm Mr. Ibrahim Magu as the substantive chairman of the EFCC. Magu has been acting chairman for over three years. Except the in-coming senate does the needful, Magu may end up serving a full four-year term without confirmation. Many of us believe that the senate refused to confirm him because of the way he has been “dealing” with a section of the political class since he was appointed. Typically, senate confirmation hearings are a joke. “Take a bow” is a popular line in the red chamber. I remember a senator ridiculously asking Mr Rotimi Amaechi at his screening in 2015: “How did you give a bloody nose to the PDP in the general election?” (I rephrased it). But when it came to Magu, the senators suddenly became diligent and decided that he failed screening. Regardless, Magu could still have been cleared if they wanted, going by the character of senate screenings. Nevertheless, Usoro’s matter is already in court, so there is an extent to which I can comment. In the end, the courts will listen to the lawyers, examine the facts and make a pronouncement. We just have to be patient. I must confess I happen to be one of the supporters of Magu because of the way he has been touching hitherto untouchable elements in the society. However, I am also intelligent enough to know that he needs to improve on his mode of operation. I am most worried when people’s reputation has been destroyed in the process and they spend years trying to clear their names. They may be finally acquitted, but those who heard the beginning of it may not bother to wait for the conclusion. The most painful thing, in my view, is when you are wrongly accused or the facts are deliberately twisted just to achieve a political end. Your name is ruined even if, legally speaking, nothing could be proved against you. An example that easily comes to mind is the ouster of Mrs Patricia Etteh as speaker of the house of representatives in October 2007 after she had spent just four months in the saddle. She had set the record as the first (and only) female speaker in the history of Nigeria, but some people were resistant to the idea that both chambers of the national assembly were being led by people of the same religion. Also, some conservatives could not stomach subjecting themselves to the leadership of a woman. They moved against her. Hon. Farouk Lawan led an “Integrity Group” that cooked up allegations of fraud against her. They said she illegally awarded contracts of N628million for the renovation of her official residence and that of her deputy. She was also accused of buying 12 cars. She was forced to quit and Hon. Dimeji Bankole was installed for religious balancing in the leadership of the national assembly. How many Nigerians today know that Etteh did not commit any offence, that she awarded no contracts (that’s the job of the national assembly tenders board, chaired by the senate president), and that she did not steal a kobo? Most importantly, how many Nigerians know that the house apologised to Etteh at its last sitting in 2011, saying there was no fraud? That’s the part that pains me the most. Unfortunately, no matter how political we think corruption accusations are and the resultant collateral damage, the accused must still defend themselves. In a developing country and a developing democracy such as ours, it is very difficult for the government to resist the temptation of picking and choosing who to go after. It is also human to spare your supporters and target your opponents. Since the EFCC was established in 2004, those at the receiving end have always complained about political vendetta. The good thing, I have to point out, is that the judiciary is there to deliver justice. 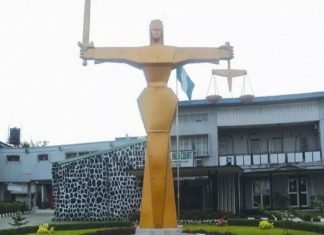 The accused, as in the cases of Onnoghen and Usoro, have to defend themselves, no matter how strong the suspicion of political motive. The bigger tragedy would be if the judiciary itself is too cowed to do the right thing. That, much more than vendetta, is what should worry us. Many police officers, especially those of the SARS variant, have been killing innocent citizens for fun and getting away with, but Olalekan Ogunyemi, an inspector, might have pulled the trigger on himself when he allegedly murdered Kolade Johnson on Sunday, March 31. The hapless young man had gone to watch a football match at a viewing centre when his life was reportedly terminated by Ogunyemi who was looking for “cultists” — that is, anybody with tattoo, torn jeans or dreadlocks, according to police’s definition. My earnest prayer is that the killing of Citizen Kolade will finally lead to reforms on the use of firearms by the police. If not, Kolade’s death would be in vain. Tragic. So after all the maiming and the killings, military occupation and unprecedented delay in the official announcement of results, Chief Nyesom Wike of the PDP has been re-elected as governor of Rivers state. It always seemed to me that Wike was going to win no matter what the federal forces did, although we must also not discount the fact that if APC had been allowed to field a candidate, it would have been tougher for Wike. What a pity that so many people needlessly lost their lives in the deadly battle between erstwhile best friends — Wike and Rotimi Amaechi, minister of transportation — for the soul of one of Nigeria’s richest states. Depressing. The next senate president or speaker should be a Christian, according to the Christian Association of Nigeria (CAN). This, it said, is in keeping with the tradition of the national assembly since the return democracy in 1999. There is a small error of fact though: in 2007, David Mark and Patricia Etteh were senate president and speaker respectively. Indeed, in the second republic, we had Joseph Wayas and Edwin Ume-Ezeoke (later Benjamin Chaha) as senate president and speaker. In the third republic, Iyorchia Ayu (later Ameh Ebute) and Agunwa Anekwe held those positions. These were all Christians. Who did it help? While I normally favour “balancing”, I will not kill for it. Diversion. We might have finally found the solution to crimes such as kidnapping and banditry. Governor Nasir el-Rufai of Kaduna was driving on the road between Abuja and Kaduna when his motorcade ran into an operation by kidnappers at Akilubu village. His security team quickly intervened and the criminals fled while their wounded victims were taken to the hospital. That gave me an idea. Can our governors be driving around their states everyday and blaring siren at full volume to scare away robbers, kidnappers and other miscreants? It seems to work wonders. Since no kidnapper dare move close to a governor’s convoy, the citizens can enjoy from the executive privilege. Immunity.